Banshee is the mutant master of sound! With his mighty scream he can rocket himself into the air and fly at near super-sonic speed or shatter the strongest steel. Banshee can even hypnotize enemies . . . Forge is the X-Men's brilliant high-tech weapons inventor. Not only can he custom design a deadly arsenal in almost no time... he's ready to jump straight into action and use it! In fact Forge is su. 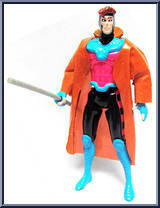 . .
Gambit has the mutant ability to take the energy of any object and put it to his own use. That use usually means turning the object into a deadly weapon. Gambit is a martial arts expert with a light. 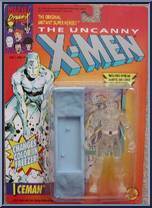 . .
Iceman has the mutant ability to turn himself into a being of living ice. Once he does that, he can create almost anything he wants: ice slides, ice weapons, ice shields, not to mention icicles and s. . .
Magneto is the awesome leader of the Evil Mutants. The X-Men consider him the most dangerous Evil Mutant alive, and with good reason! As the master of magnetism, Magneto can with the merest thought . . .
Mr. Sinister is a mysterious Evil Mutant mastermind who loves to plot and scheme but prefers to let others do the fighting for him. But if he's trapped and has to fight...watch out! He's super strong . . .
Sabretooth is Wolverine's greatest enemy. Both are products of the Top-Secret Weapon X program. But instead of using his super-sharp claws and fighting abilities for good, Sabretooth became the Evil. . .
Sauron is the most terrifying Evil Mutant. 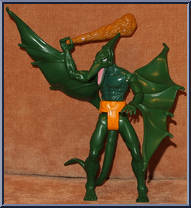 Sauron loves to silently swoop down and use his mutant power to hypnotize and drain the energy out of his victim! Then in the blink of an eye, he flies awa. . .
His super-sharp adamantium claws can slash through steel. His mutant healing ability can mend even the worst wounds in minutes. He's Wolverine, the best at what he does and what he does best is figh. . . When it comes to fighting Evil Mutants, the X-Men know there's no one better than Wolverine! 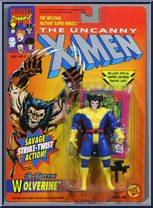 With his razor-sharp adamantium claws, his lightning-quick reflexes and his unmatched combat experience, W. . .